Monday I shared how my birthday this year was being carelessly overlooked by my cousins wedding. Unfortunately, this year is not the first year my birthday has been cast to the side like bad chocolate. My birthday has always been close to Thanksgiving. Usually growing up it fell on the week of or weekend before thanksgiving (like this year). Which as a kid posed a huge problem. For most of my childhood we were lucky enough to get the whole week of Thanksgiving off. That meant no school but also meant no special treatment at school for being the birthday kid. It also meant no birthday parties around my actual birthday. Being Thanksgiving vacation meant most of my friends were out of town. And then with the hustle and bustle of the holidays (not to mention expense) I never had my birthday party in the month of November or December. Usually my birthday party was combined with my younger sister’s birthday party in January (when her birthday is). Having a combined birthday can be fun, at times, but sometimes you just want a party of your own. 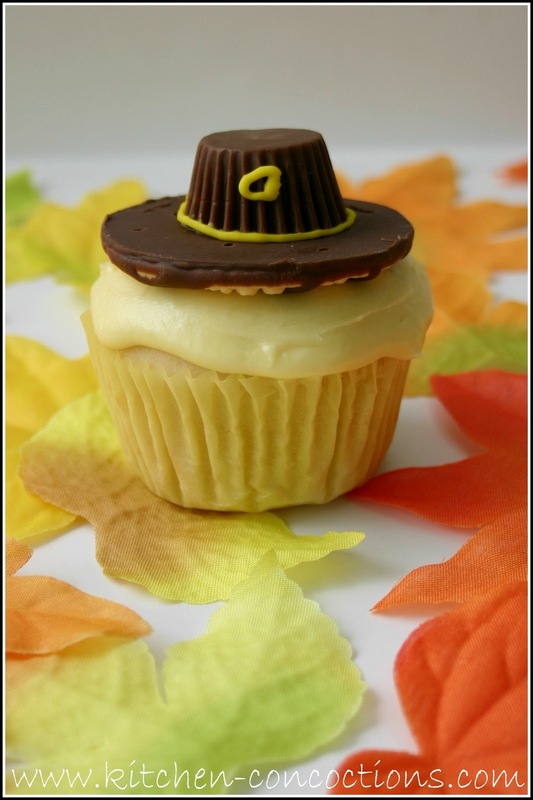 So even though thanksgiving has sometimes ruined my birthday celebrations over the years these cute pilgrim cupcakes were way to cute to pass up! Your basic white cupcake topped with classic buttercream (conveniently reduced to just two servings because someone (cough, cough, me) has had way too much cupcakes lately) and then decorated with a cute yet simple, and edible pilgrim hat! What a cute and kid friendly dessert for the second most important day in November! Note: I tinted my frosting yellow but you could also use fall colored sprinkles and decorate the top of your cupcakes before topping with the ‘hat’. 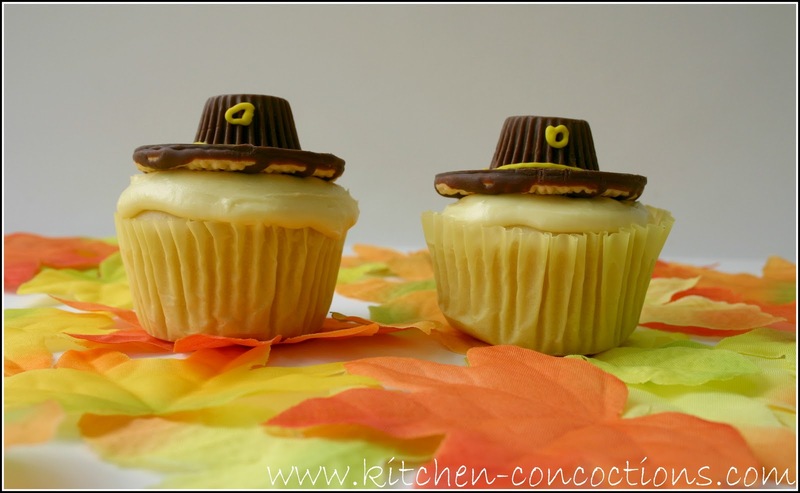 You could also ‘cheat’ and buy store bought fall decorated cupcakes and just top with the hats for extra cuteness. Oh, one more thing. 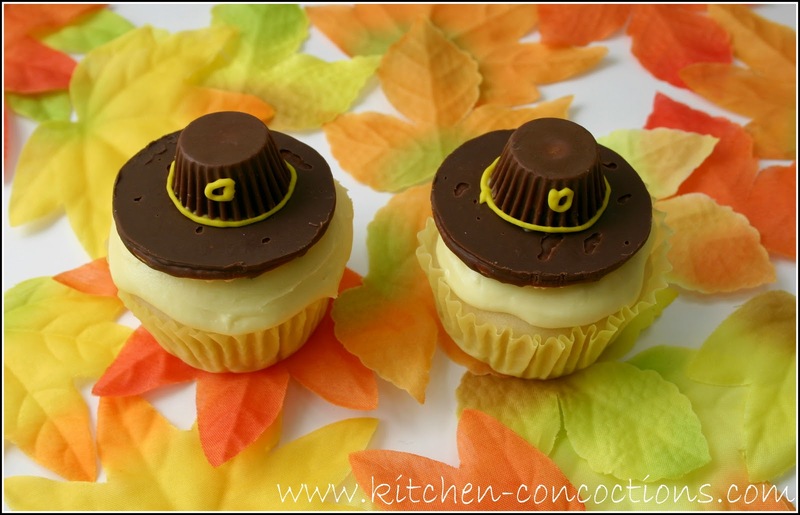 You could easily turn these Pilgrim hats into Abe Lincoln hats with the addition of an extra peanut butter cup. Heeelllllooooo, your child would totally ace that civil war book report if they brought in Abe Lincoln cupcakes! Put a dot of frosting on the top of the peanut butter cups. Adhere the cup to the bottom side of the fudge cookie. Frost each of the cupcakes with buttercream frosting. Using yellow tubed decorator’s frosting, pipe on the buckle and the base of the hat. Put one cookie on each cupcake. In a bowl, add egg white and sugar and whisk until combined. Add in vanilla, almond extract and melted butter and stir until mixed. Add flour, baking powder and salt and stir until smooth. Stir in milk. Divide batter equally between the 2 cupcake liners. Cream the butter and vanilla extract. Slowly add the powdered sugar one cup at a time alternating with the milk, mixing until desired consistency is reached. If your birthday is the same date as this post, then my daughter shares the same birthday with you. She's turning one on the 18th and I was so glad it was before Thanksgiving! I was worried she would have a birthday that competed with the holiday. Hi Heather! Happy 1st birthday to your daughter! My birthday is actually November 19th, so it usually never falls actually on Thanksgiving, just a few days before! And yeah I am glad our birthdays don't fall exactly on holidays, I have a friend who's daughter’s b-day is Dec. 25, because how can you compete with Christmas!